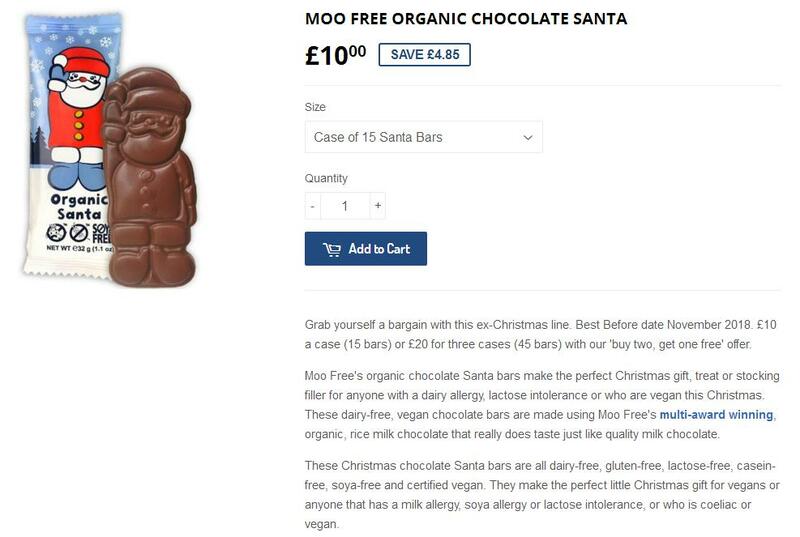 The Vegan Magpie: Moo Free Christmas chocolate sale! Hello! Moo Free have an outlet type place where broken products and out of season products are sold. At the moment, they are selling Moo Free Santas and Snowmen and 15 for £10. This is a pretty good offer, however these packs are on buy 2 get 1 free! So you can get 45 bars for £20! Yay! Just head here: https://www.dairyfreechocolates.com/collections/monthly-offers where you can find the Santas and Snowmen, as well as other tasty offers! Postage is £3.99 or free over £30. Expiry dates are November 2018 for the Christmas stock. It's worth checking this website every so often as offers are frequently added.